Hon. Eric Stephen Ripper MLA BA, DipEd. Elected to the Thirty-Second Parliament for Ascot at the by-election held on 19 March 1988 to fill the vacancy consequent upon the resignation of Malcolm John Bryce. Electorate abolished in the redistribution of 1988. Elected to the Thirty-Third Parliament for Belmont (new seat) on 4 February 1989. Re-elected 1993, 1996, 2001, 2005, 2008. Deputy Chairman of Committees from April 1989 to March 1991. Minister for Community Services (Community Development from 7 September 1992); Disability Services from 20 August 1991); The Family (from 7 September 1992); Youth Justice (from 7 September 1992) from 5 February 1991 to 16 February 1993. Leader of the House in the Legislative Assembly from 26 October 1992 to 16 February 1993. 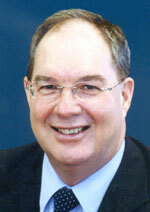 Deputy Premier; Treasurer; Minister for Energy from 16 February 2001 to 26 February 2005. Deputy Premier; Treasurer; Minister for Government Enterprises; Minister Assisting the Minister for Public Sector Management from 10 March 2005 to 13 December 2006. Deputy Premier; Treasurer; Minister for State Development from 13 December 2006 to 6 September 2008. Deputy Leader of the Opposition from 20 December 1996. Shadow Minister for Community Development; Family from 17 February 1993 to 7 February 1994. Shadow Minister for Water Resources; Works and Services from 7 February 1994 to 18 October 1994. Shadow Minister for Finance; Commerce and Trade from 18 October 1994 to 23 January 1995. Shadow Minister for for Resource Development from 23 January 1995 to 18 March 1996. Shadow Minister for Resource Development; Parliamentary and Electoral Reform; Finance (from 15 October 1997) from 18 March 1996 to 15 January 1997. Shadow Minister for Education; Accountability from 15 January 1997 to 4 August 1999. Shadow Leader of the House in the Legislative Assembly from 17 February 1993 to 15 January 1997. Spokesperson for Treasury; Energy; Accountability from 5 August 1999 to 10 February 2001. Leader of the Opposition; Shadow Minister for Public Sector Management; Native Title from 26 September 2008 to 23 January 2012. Member Public Accounts and Expenditure Review Committee (Chairman from April 1990) from April 1989 to March 1991. Member Joint Standing Committee on Delegated Legislation from April 1989 to 19 March 1991. Joint Chairman Estimates Committee C 1990. Member Standing Orders and Procedure Committee from 22 June 1993 to 7 September 2000. Member Procedure and Privileges Committee from 8 September 2000 to 10 January 2001. Member Select Committee on the Reproductive Technology Working Party's Report from 15 November 1988 to 15 December 1998. Member Select Committee on Energy and Processing of Resources from 27 September 1989 to 12 November 1991. Member Select Committee on Science and Technology from 24 March 1994 to 24 November 1994. Member Select Committee on Procedure from 12 October 1994 to 27 June 1996. Member Select Committee on Crime Prevention from 15 October 1997 to 23 September 1999. Born 13 September 1951, Subiaco, Western Australia. BA, DipEd. School teacher, union organiser and ministerial adviser. The electorate of Belmont is located in the East Metropolitan Region and includes the suburbs/towns of Ascot, Belmont, Cloverdale, Redcliffe, Rivervale and parts of Kewdale and South Guildford. Enrolment (26 February 2007) 20,912; area: 59 sq kms.